(c) the relevance (a) has to the Streatham and Brixton Chess Blog today. Much kudos and cake to the reader who can provide us with three satisfactory answers. All will be explained soon . . . Suppose white can castle. 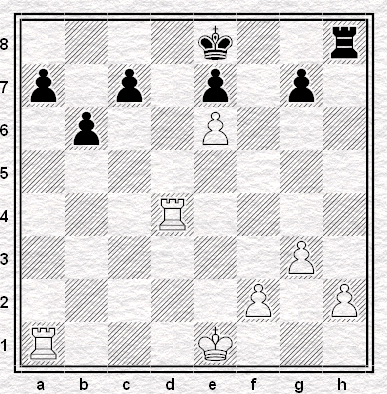 Then the white king has never moved, and so the rook from h1 cannot have got out of the bottom-right corner. What, then, is the rook on d4? It is not the king's rook (which never escaped), nor the queen's rook (which is still on a1), so it is a promoted pawn. Now where did this pawn promote? If it did so on e8 or h8, the relevant black piece has obviously moved and so black cannot castle. If it did so on anywhere from a8 to d8, it got out via d8, and so must have displaced the black king along the way. And if it did so on f8 or g8, it must have either got out via f8 (again displacing the black king) or h8 (displacing the black rook). So if white can castle, black cannot, because either his king or his rook has moved. So the key-move is 1.O-O-O! with an unstoppable threat of 2.Rd8#. (1) Why isn't 1. Rxa7 just as good? (2) What happens if White can't castle, and the rook on d4 is the original h1-rook? It appears quite possible that the last moves were 1. ... Nc6-d4 2. Rd3xd4 b7-b6, for example, meaning Black can still castle and that is his defence to all three key-moves. Actually, I think I sort of see now. If White were to start 1. Rxa7, then Black would claim 1. ... 0-0 as a defence. But because we are allowed to assume in problems that castles is legal unless proved otherwise, White must play it (1. 0-0-0) to prevent Black from castling in reply. Relevance to S&B blog? Sorry, that one escapes me. That leaves the relevance to our little blog. As a clue ... might I suggest you compare the solution to the question what's the first move with the title to the previous post? We have a winner. Today's blog entry - amazingly - is our 1000th post. To quote that great thespian Sir Vincent Jones, it's been emotional, but here's to the next 1000. Thanks Jack for the exegesis. It means I don't have too much left to add about a puzzle that really is spectacularly complicated in conception. It's all about proving that both sides are not allowed to castle. If the Rd4 originally came from h1, then white can't; if it's a promoted rook, then it must have dislodged the black king along the way. So to prove that he can castle, white castles! 1.0-0-0 makes 1...0-0 illegal. This is why, Anonymous, 1.Rxa7 and 1.Rad1 are both no good--- because then black castles to prove that he can castle, meaning that white can no longer give mate in two. Jack: you're going to have to share your prize with PG. Would you prefer the kudos or the cake? By the way, the puzzle is Armand Lapierre's baby, and it was published in Themes in April 1959. Cake, I think. A nice Victoria sponge, or something. Oh I wanted the cake as well. Maybe a chocolate gateaux. "posted by Tom Chivers @ 10:00"
Well spotted BlueRaja; there's also another clue in the post. I think PG deserves the cake! Fantastic puzzle. I have to drop by more often. I predict that about 999 posts after this one, there'll be one to which the solution involves 2.O-O-O.